Like any good American woman, I spend a significant portion of my income (and time!) at Target. Today, after wandering the store for too long, I had only 15 minutes to pay before camp pick up. Seven minutes later, I was still in line. When I finally paid, I rushed out the door and walked all the way…to my bike, which was conveniently parked Right There. I buckled my infant in the trailer, threw my bags in the back and hopped on. Three minutes ’til pick up. I zoomed down Sacramento and pulled up right at the back door of the JCC. 2:01PM. Not bad. I might mention that the baby was now sleeping from the ride, and I left him under the watchful eyes of the kind counselor at the door. 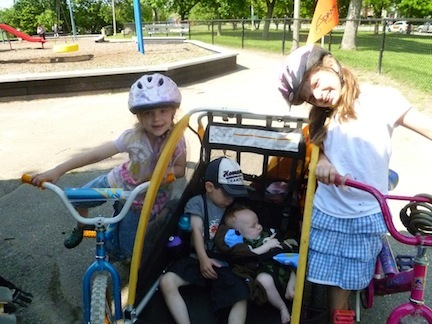 For those of you who say you are in awe of how much I bike with my kids, don’t be. It’s just plain easier. Aren’t I scared to ride in the street? No, obviously. Cars are apparently more scared of me because they tend to drive a mile around me. I watch where I’m going, veer off onto the sidewalk when it’s too crowded (or too filled with potholes) and teach my kids the traffic laws and bike signals. Bike shop or big-box store? An adult bike should last forever. A Target bike might. Or it might not. And when it breaks (which it will), the bike shop guy will tell you he can fix it, but it broke because it was cheaply made in China. A good-enough bike from a bike shop can run between $250-$350. I like the Pony Shop in Evanston. I have both because I used to lug three kids around. The baby seat is a slimmer ride, but it throws off the balance of the bike. I’m pretty used to it, but I don’t prefer it. The trailer is much more comfortable to use, and it somehow doesn’t feel particularly wide. It’s safer because if the bike falls, the trailer stays upright–believe me, it’s happened. 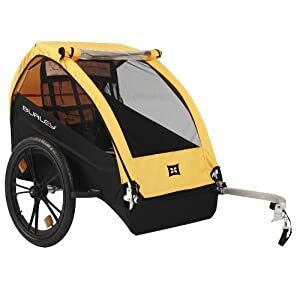 Schwinn trailers are available at Target, sometimes for as little as $100, but you get what you pay for. The canvas tends to rip for a heavy user. I have the Burley Bee, which runs $250 on Amazon. It’s guaranteed for life. How much gas do I save? About 50% less gas in the summer months. I bike for transportation, which means whatever I’m wearing is how I bike–shaitel and all. I have an old skirt I store in the trailer to toss over my clothes on days that my skirt is inconvenient. Other biking benefit – you’re in incredible shape! how about never having to look for a parking spot! parking at the J during drop off and pick up is not fun!